One Mind Yoga invites you to join our community of welcoming, friendly students and extraordinary, experienced teachers. 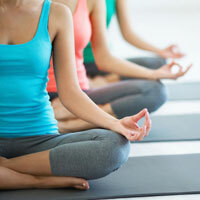 Together we will develop your strength, stability, flexibility, mental clarity and a peaceful mind. A unique and exciting part of OMY is our TRX Suspension Training studio! Arguably the best piece of HIIT (High Intensity Interval Training) equipment and yoga prop, the TRX Suspension Trainer leverages gravity and your body weight to perform hundreds of exercises and poses. With TRX you are able to execute highly functional exercises to build strength, balance, and core stability. When it comes to the fusion TRX and Yoga, the TRX suspension Trainer becomes the ultimate yoga prop to help enhance core stability, strength and flexibility. OMY Owner Lindsay Lambert and her certified instructors will help you find the right class for every age and ability. Beginners will start by building a solid foundation in our beginner-friendly yoga, TRX Yoga Fusion and Basics classes. As a student develops a consistent fitness routine, there will be a need for new challenges to prevent hitting a fitness plateau. Which is why OMY also offers intermediate/advanced yoga, TRX HIIT and TRX Yoga Fusion classes that are designed to take our dedicated students to a new level! We invite you with open arms to join our OMY Community! We offer certified, beginner-friendly yoga & TRX classes daily! Start your journey with us today!